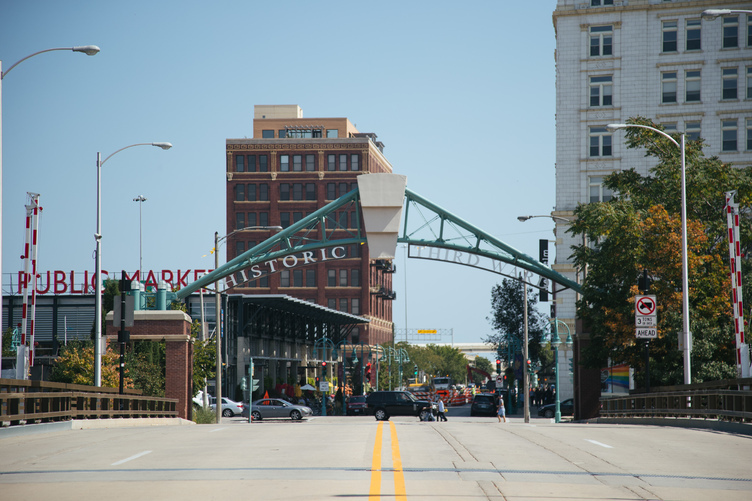 A historic city that saw an industrial boom around the turn of the 20th century on the shores of Lake Michigan, Milwaukee is full of surprises. From its distinctive neighborhoods—where one-time factories have been transformed into exciting new restaurants and stylish shops—to the many festivals at Henry Maier Festival Park to the RiverWalk and its beloved “Bronze Fonz”(yes, that Fonz, the Henry Winkler character from the 1970s “Happy Days” TV show), Milwaukee knows how to have a good time. Locals pride themselves on “looking for the fun in any situation.” But they shouldn’t have too much of a challenge—their city is an enormously fun place. To give you an insider’s look at Wisconsin’s largest city, we asked the locals what to do when you visit. Here are a few favorites. A city of neighborhood pubs, classy old cocktail lounges, and fun-loving dives, Milwaukee is a social town—and bars are integral to its identity. One key to the city’s culture, locals explain, is the Brandy Old Fashioned. A variation on the widespread whiskey variety, this only-in-Wisconsin version is “different than anywhere else.” With a summary brightness that warms the Midwestern winters, it’s been a Milwaukee mainstay since Korbel introduced the drink at the 1893 Chicago World’s Fair. Milwaukeeans took a liking to it and 125 years later, the Brandy Old Fashioned shows no sign of letting up. You can get the drink at any bar in the city, but locals will send you to Five O'Clock Steakhouse, where you’ll also find what some call the “best steak ever”—an enormous, and enormously tender, filet mignon—and vintage supper club accompaniments like a relish tray and shrimp cocktail. Insider ordering tip: Ask for “sweet” for a splash of Sprite or 7up, a “sour” for grapefruit-flavored Squirt, or a “press” for a sweet and club soda combo. If these distinctions seem minor, don’t mention it to a Milwaukeean or they’re likely to set you straight. Even if you’re not a die-hard motorcyclist, like many of the million or so Harley-Davidson riders, locals say the Harley-Davidson Museum is worth a stop. It tells the story of this iconic American—and Milwaukee-based—brand with exhibits that’ll grab the attention of even non-hogheads (that’s Harley Owners Group members, for you uninitiated). Even the museum’s Motor Bar and Restaurant is “fantastic,” say locals, with tasty helpings of all-American comfort food. For a raucous good time, head to the UW-Milwaukee Panther Arena and catch the Milwaukee Roller Derby’s Brewcity Bruisers. The women's roller derby league is made up of four home teams with spirited names—the Crazy 8s, Rushin’ Rollettes, Shevil Knevils, and Maiden Milwaukee—and a commitment to full-contact fun at any cost. Milwaukee is the rare town where it’s not uncommon to see someone drinking a Bloody Mary outside of brunch hours. While this spicy, savory, tomato juice-based cocktail is a morning-time and/or hangover beverage in most of the United States, Milwaukeeans love them any time of day. The bigger and more flamboyantly garnished, the better. For locals, that means one thing: Sobelman’s, where classic condiments have been taken to an outrageous extreme. Imagine a melon-sized mug overflowing with skewers of bacon-wrapped cheese balls, big pink shrimp, meat sticks, five kinds of olives, and an entire slider-sized hamburger. “You don't even need breakfast!” If you’re feeling adventurous, throw down $60 for the “Bloody Beast,” which counts an entire fried chicken among its toppings. What happens in Milwaukee stays in Milwaukee? In recent years, the lakeside Bay View neighborhood has morphed into Milwaukee’s “hipster haven”—and a foodie destination. At Odd Duck, the menu’s long and exotic with small plates featuring flavors that span the globe. Expect long lists of eclectic ingredients, like Sichuan-style pork belly, tatsoi, scallion, rice cake noodle, confit potato, and pickled shiitakes. Or, fried frog legs with cheddar grits and bourbon blueberry, green tomato slaw and Creole sauce. It’s a charming, oddball little restaurant that transports you from China to the American South, France to Mexico without having to leave the shores of Lake Michigan. European-inspired Café Centraal could have contented themselves with their massive beer list and irresistible frites (in both traditional and sweet potato varieties and 11 house-made dipping sauces). But they didn’t. They kept going, and going, creating a full and wide-ranging food menu designed to tempt every palate: Every offering, including desserts, are followed by a suggested beer pairing. Getting the horseradish herb-crusted salmon? Pair with Ommegang's Hennepin. The hot beignets with hot chocolate sauce? Try the Lindeman’s Framboise. Resistance is futile. Making a name in brewing history, Milwaukee is home to household names like Miller, Pabst, and Schlitz. For an immersion in the city’s beer lore, head to the Pabst Milwaukee Brewery & Taproom for the Beer History Tour. Once the largest brewery in the country, Pabst left Milwaukee in the late 1990s but then triumphantly returned to its hometown in 2017, fueled by PBR’s cult status among a certain cool, young set. But the city isn’t all about the oldies. Milwaukee has welcomed a new generation of upstart breweries. Housed in a sturdy 1908 Milwaukee Electric Railway and Light Company building that was once a coal-fired power plant, Lakefront Brewery has innovative, beautifully packaged beers—including a Green Tea Ale light beer and the “Polka Incident” double IPA—and is home to a kitschy piece of Milwaukee history: the Bernie Brewer’s Chalet. The German influence on Milwaukee can be seen on every virtually corner, from its sausages and brats to the Miller Park home games of Major League Baseball’s Brewers, who have a goofy sixth-inning tradition featuring sausage-clad mascots racing each other around the field. For a more authentic experience with the city’s German heritage, head for one of its many restaurants or biergartens. A local favorite since 1924, Kegel's Inn has stood the test of time. This Bavarian-style beer hall is famous for their roast duck, but serves a full menu of classic dishes, like Hassenpfeffer (rabbit stew), Beef Rouladen (beef cutlet rolled and stuffed with bacon, onions, grain mustard, and pickles), Wiener Schnitzel (pounded and fried veal). And, like any old-school Wisconsin restaurant, Kegel’s has a lively Friday night fish fry, perfect for grabbing a stein of Kölsch and striking up a conversation with some friendly, glass half-full Milwaukeeans. Prost!